Socialists, students and anti-capitalists were joined by former miners for a demonstration in London’s Trafalgar Square on Saturday. 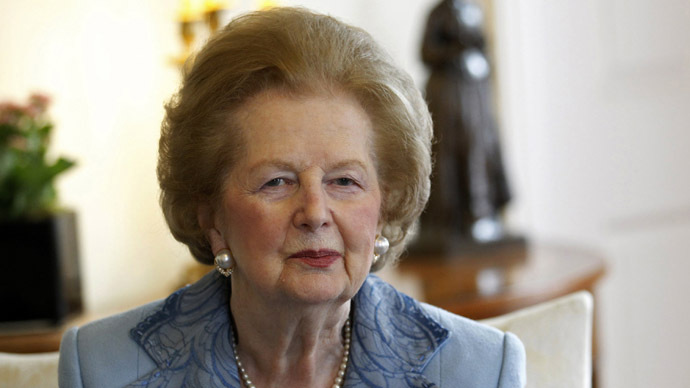 Many Britons remain harshly critical of Prime Minster Margaret Thatcher’s polices, two decades after she left office. Sixteen people were in police custody after the demonstrations in Trafalgar Square. Most of those in custody were arrested for being drunk and disorderly during the early hours of Sunday morning. 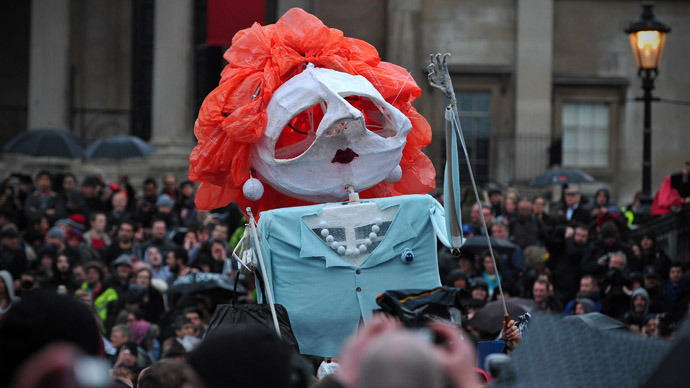 The event, which was promoted by various Facebook groups throughout the week, sparked fears of potential rioting after organizers promised that thousands would flood London’s Trafalgar Square to bid Thatcher a not-so-farewell. But inclement weather put a damper on the celebration – the event, billed the “party of a lifetime,” reportedly drew only several hundred people. Chants of "Maggie, Maggie, Maggie, dead, dead, dead" filled the air as revelers popped bottles of champagne and danced under intermittent rain showers. “We live in a democracy where people are entitled to protest, where they are entitled to have fun and do what they want. What they can’t do is, I think; use the death of an elderly person to begin riot or a fray or that sort of thing. So we’re getting ready for all that,” Johnson told LBC radio. London's Metropolitan Police, who were reportedly keen to avoid accusations of overreacting to a peaceful demonstration against Thatcher’s legacy, said they were surprised by the low turnout. In the end, there were reports of a few rowdy protesters setting off flares and lobbing beer cans at police lines. But apart from a few minor scuffles and nine arrests for drunk and disorderly behavior, the event was mostly peaceful. Saturday’s protest had no official organizer. 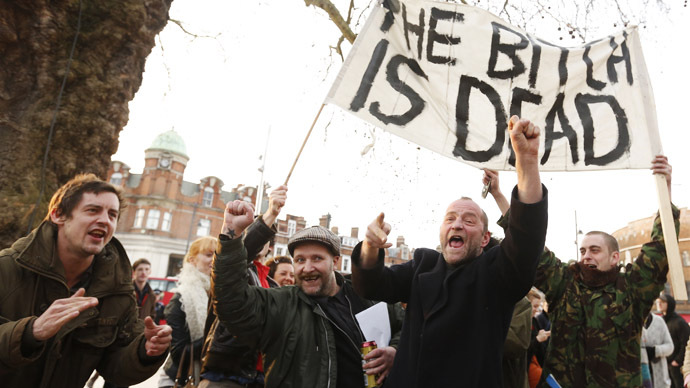 However, two decades ago, the now-defunct 1980s anarchist collective known as Class War vowed there would be a gathering on Trafalgar Square on the first Saturday after Thatcher’s death. “As one of the few Class War warriors still about, I thought it was my duty to speak up on behalf of the event,” said Ian Bone, Class War’s most famous activist. A delegation of miners from Durham in northeast England and former mining areas of Yorkshire and South Wales also attended the event. Twenty years after the UK's yearlong miner’s strike – in which Thatcher battled miners and trade unions to close huge numbers of facilities that had been deemed unprofitable – there is still anger and resentment among the communities that were wiped out by her policies. “She destroyed our communities, she destroyed our villages, she has destroyed our pits and she tried to destroy our dignity,” General Secretary David Hopper of the Durham Miners Association told the Guardian. Tony Smith, a former miner from Nottinghamshire, said that any concerns over the impropriety of celebrating Thatcher's death paled in comparison to the anger felt by those affected by her policies. “The strength of feeling is so deep it overrides any reservations. We’ve lived under Thatcher’s shadow for many years. It split families right down the middle and that resentment is still going on,” he explained. In addition to the protest in Trafalgar Square, Facebook sites have been set up calling for parties to be held to celebrate the former Prime Minister’s death. The Maggie’s Good Riddance Party said it will hold a “right jolly knees up” outside St. Paul’s Cathedral on the day of her funeral, which is scheduled for Wednesday, and turn their backs on the funeral procession as it passes. However, activists are aware that if they turn up at the funeral they will likely be arrested, said Val Swain, a spokesperson for police-monitoring group Netpol. Though Thatcher remains a polarizing figure, supporters tout her role in revitalizing Britain, even if it meant putting millions out of work. When she came to power in 1979, the UK was known as the "sick man of Europe," and the country was gripped by strikes and social unrest. By the time she left office in 1990, the British economy and culture had been transformed: Some industries such as the financial sector were ascendent, but others like manufacturing would never recover. Thatcher's funeral will begin with a procession from Downing Street to St. Paul’s Cathedral, a gun salute will be fired from the Tower of London, and her coffin will carried into St. Paul’s by servicemembers from regiments and ships associated with the Falklands campaign. This will be the first funeral of a British politician attended by the Queen since Winston Churchill’s in 1965.